It’s such a happy place! The Omidyar K-1 Neighborhood at Punahou School. What a joy for students, families, and teachers alike! The new state-of-the-art learning facility was open to alumni yesterday, so DH and I went to visit. Whenever we drove up Punahou street since the school broke ground for the Neighborhood, we’d glance over at the construction going on on the side of Rocky Hill, wondering if Miss Marvelous might attend school there in a few years. The new award-winning space opened to 150 kindergarteners and 150 first graders in the Fall of 2010. The welcoming landscape design, planned with curricula in mind, captured my childhood imagination. Child-size garden pathways, native plants, soft surfaces, an amphitheater. Arched wooden bridges over dry streams lead from classrooms to play areas where the absence of playground structures is refreshing. (There are a few in the phys ed area.) Just a couple of large soft boulders in the middle of a beautiful lawn. The indoor-outdoor environment of each classroom is designed so that everything in this neighborhood is integrated – art, music, physical education, traditional academics, children’s ages – and in proximity. Each classroom has a raised box for planting what vegetables, fruits, and flowers the children want, a cistern with water pump, and garden tools. Punahou designed a space that nurtures the experience of being whole for the youngest of students. Interior classroom and project room spaces are bathed in natural light. Oh, such pretty furniture and fixtures designed for little people! The teachers and children must be in heaven! Stimulation and wondrous things everywhere! It inspired me to improve the spaces at the studio for Miss Marvelous. A $6 million challenge grant from alumnus Pierre (founder of eBay) and Pam Omidyar provided the basis for the Neighborhood. The project received a LEED (Leadership in Energy and Environmental Design) Platinum Certification by the U.S. Green Building Council. What a wonderful gift! Walter Kau, wonderful friend to my mother’s family, died on Dec. 20, 2010. “Uncle” Walter was a very dapper fellow with so much talent, impeccable taste, friendship, love and light. Really a wonderful man. He taught my mother organ. I remember the stage musicals he played for and directed. 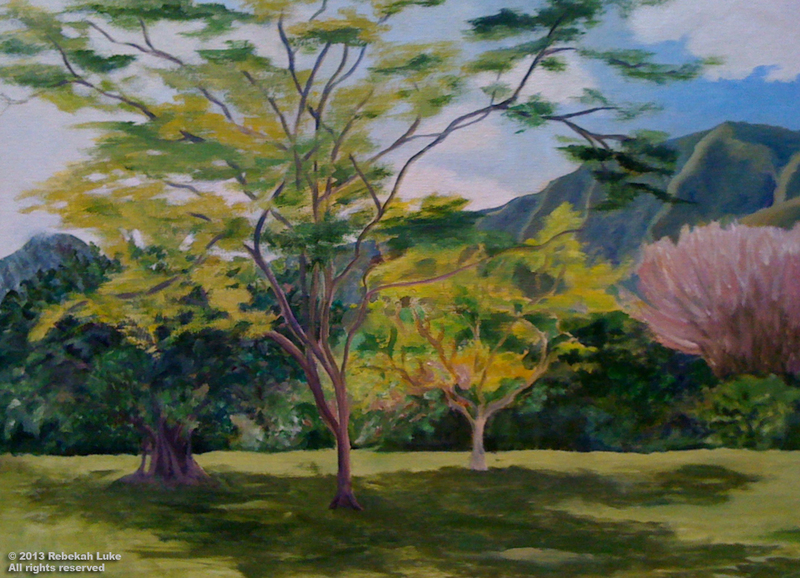 I remember the dinners he cooked for my aunties and uncles on Monday nights in Kailua, and I remember the day he wrote a check for my oil painting — I think he was my first customer — straight out of the trunk of my car. What an honor! I remember bumping into him not too long ago down at Ward Center and he told me he was buying new shoes. For dancing, no doubt! He was a great friend of our family. His obituary (click on his name above) recalls just the headlines of his full life. 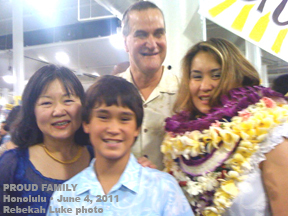 Francis “Miki” Bowers, long-time teacher and friend of Punahou School, passed on New Year’s Day. My contemporaries called him Mister Bowers from the time he was their math teacher. Later our alumni class made malasadas for Carnival under his watchful supervision until we were banned for making non-regulation sizes and shapes. Most recently I had the pleasure of singing in the alumni glee club with Miki, who played ukulele and anchored our group sound. Sometimes he was the entire bass section. He was a trouper. In failing health, he attended last month in wheelchair with oxygen tank to perform at our last Christmas gig of the season. “It is with great sadness that I share the passing of Dr. Francis “Miki” A. I. Bowers . . . on January 1, 2011. Miki was our beloved Academy math faculty who retired in 1998 with 41 years of service. “A 1945 Punahou graduate, Miki lettered in football and swimming and was student body president his senior year, the same year John Fox started as President. “In his 41 years at Punahou, Dr. Bowers taught every math course offered, served as department chair for 12 years, supervised Punahou’s SAT testing program for 25 years, and revolutionized math instruction by creating a highly successful AP Calculus program. He also coached swimming, water polo and volleyball. “In 1957 Miki inaugurated the famous Carnival malasada booth and was fondly known as “Mr. Malasada.” For over 50 years he worked with student, parent and alumni volunteers to ensure that fresh, hot, and uniform sized malasadas kept up with demand. 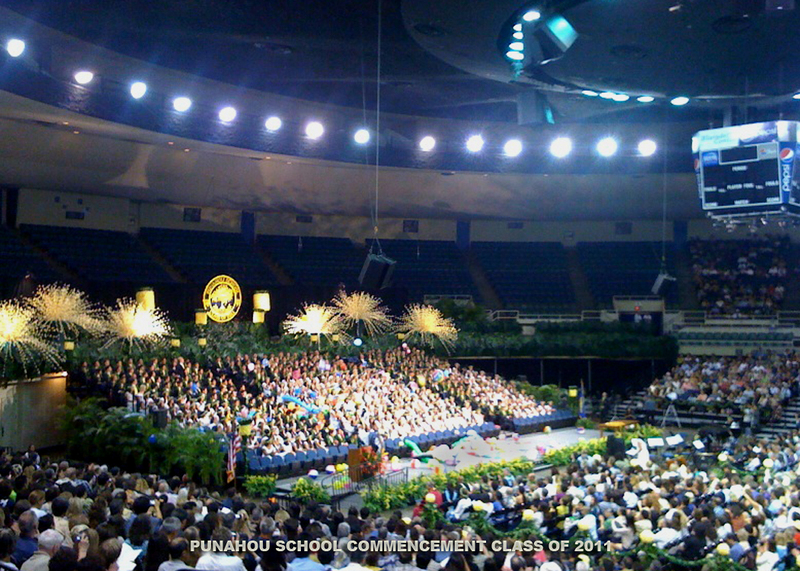 “In 1999, Miki was awarded the “O” in Life by the Punahou Alumni Association, its highest award to an alumnus – recognizing outstanding continuing service to Punahou and Hawai‘i that exemplifies the school’s tradition, spirit, and ideals. “Proud of his Hawaiian heritage and raised in a home filled with Hawaiian music, Miki was known for his booming bass voice. In the mid-1960s, he had a Sunday night television show called “Sing Along with Miki”, a live, call-in request format. 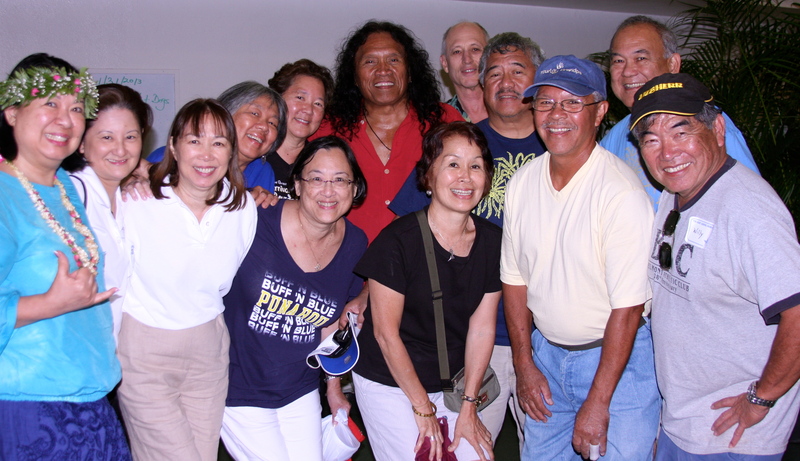 Miki also was an active member of the Punahou Alumni Glee Club and the Prince Kuhio Hawaiian Civic Club where he was a Director and a member of their choral group. Aloha dear friends. 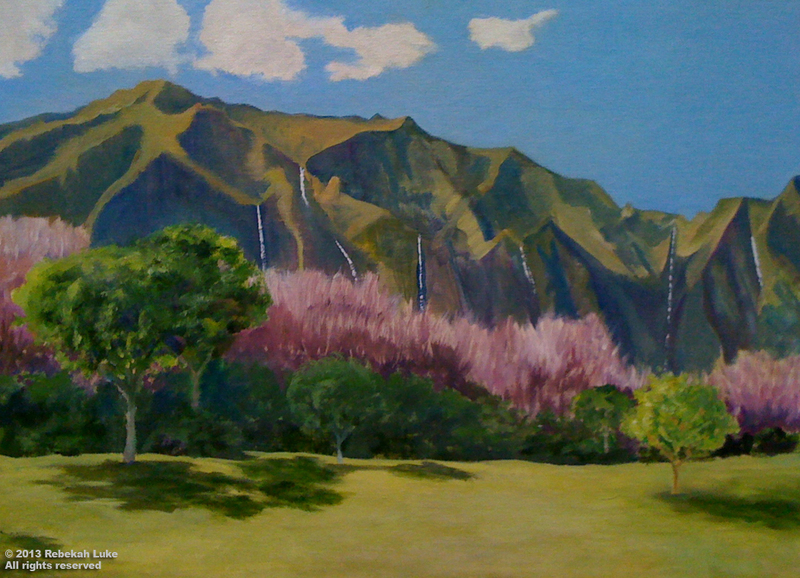 Mahalo nui. You gave us so much. A hui hou. “Guardians of Tradition” are we, I was reminded last evening. The event: a gathering of Punahou School alumni to hear a lecture by kumu Hattie Eldredge Phillips at Kauihelani, the Hawaiian resources center of the Case Middle School. Hattie is of the well-known Eldredge family that has touched the students, faculty, staff, parents, and alumni of Punahou for generations—as student leaders, teachers and coaches. In front of last night’s audience, she introduced her brother Pal, who teaches first graders, her very good friend and colleague Malia Ane, who teaches grade 3, and Malia’s mother Marilyn Ane, retired kindergarten teacher. 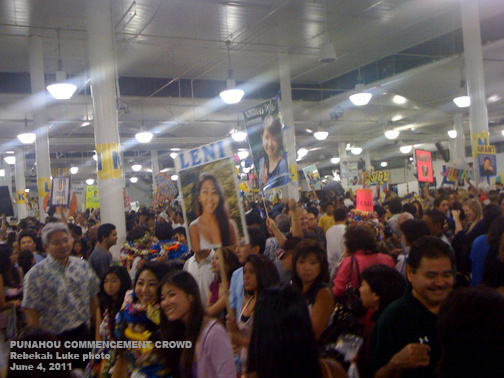 The Ane family is equally dedicated to Punahou. Each would take the microphone to share stories and mele (songs) about Punahou traditions and how they came to be, reliving the journey we alumni were all so fortunate to be a part of. None of what she does is done alone, Hattie said. 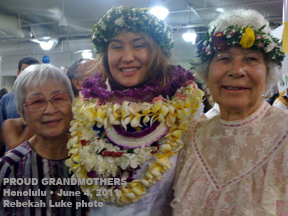 The others on stage with her and ke Akua were her allies. 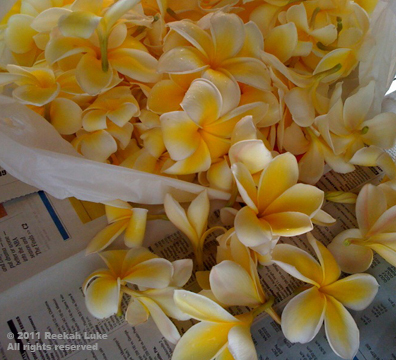 It was a bittersweet moment when Hattie prefaced that the empty rocking chair draped with lei was to be for her brother David who passed over the day before. Dave Eldredge retired from Punahou after 40 years as an athletic coach and teacher. He established the Hawaiian studies program at Punahou and designed the school’s fabulous Holoku Pageant. The Holoku Pageant was how I first met Dave—Mr. Eldredge—who was the adviser to the Hawaiian Club when I was a student, and his sister Hattie, who was one class ahead of me and taught all the hula. 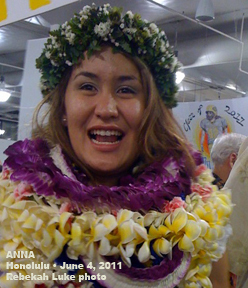 Part of the philosophy of teaching hula and mele to students was/is that the students will in turn teach the dance and music to others, thereby helping to perpetuate Hawaiian culture. And this has been happening for all the time Mr. Eldredge, and now Hattie, Pal, and Malia have spent at Punahou. Mr. Eldredge would be proud of Hattie’s program that was dedicated to him last night. The entire Eldredge family, though grieving, was present at Kauihelani, a thoroughly modern Hawaiian resource center facility that is Hattie’s domain. 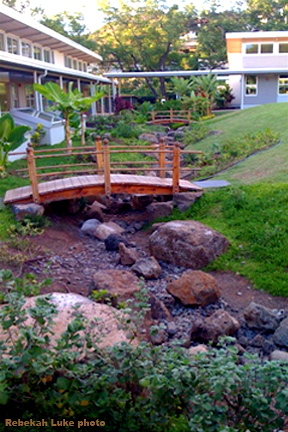 Seventh graders have a huge and great place to learn Hawaiian values, history, tradition, activities, and culture. There they can connect with real events happening in the community. Pal Eldredge, who has researched the history of Punahou School, showed us some interesting, old photos of campus, gave us the correct lyrics for the alma mater “Oahu-a” and played guitar. Marilyn Ane (Class of ’48) told how she started the “Flaming P” tradition to generate school spirit. Malia Ane, also known as “Queen of Mele,” led the gang in a group duet of “Pupu Hinuhinu” and “Maile Lei.” It was Malia who started the tradition of teaching Hawaiian songs to the elementary grades. 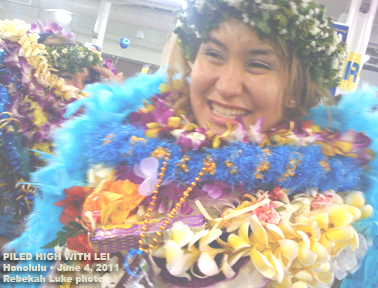 Leilehua Phillips, Hattie’s daughter and past queen of the Holoku Pageant, performed a hula. Hattie inherited the directorship of the pageant from Dave few years ago. 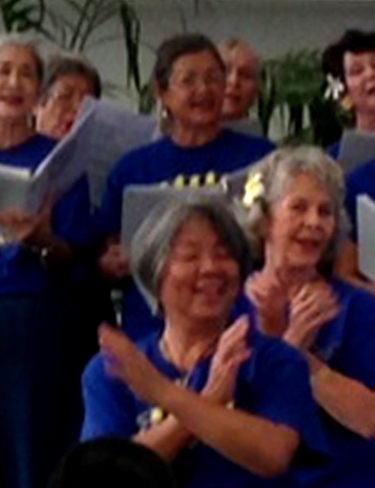 We all sang a medley of Punahou fight songs. The women—Hattie, Malia, and Marilyn—were football song- and cheerleaders, no surprise! We are shown the way by those who came and went before us. We have only to listen for their guidance, follow in their footsteps and teach our children. That was Hattie’s message, and it came through loud and clear.